January 5. Oral History & Sing-Along Program at Kaunoa Senior Center, Spreckelsville. January 7. Ukulele Mixed Plate at The Shops at Wailea. January 14. Ukulele Mixed Plate at The Shops at Wailea. January 17. Ukulele Strumming Workshop at Bailey House Museum, Wailuku. January 28. Ukulele Mixed Plate at The Shops at Wailea. February 4. Ukulele Mixed Plate at The Shops at Wailea. February 6. Oral History & Sing-Along Program at Kaunoa Senior Center, Spreckelsville. February 11. Ukulele Mixed Plate at The Shops at Wailea. February 25. Ukulele Mixed Plate at The Shops at Wailea. February 28. Ukulele Strumming Workshop at Bailey House Museum, Wailuku. March 6. Oral History & Sing-Along Program at Kaunoa Senior Center, Spreckelsville. March 7. Anniversary Celebration at Central Pacific Bank, Wailuku. March 14. Queen's Festival at Queen Ka'ahumanu Center, Kahului. March 21. Ukulele Strumming Workshop at Bailey House Museum, Wailuku. March 25. Ukulele Mixed Plate at The Shops at Wailea. March 26. Oral History & Sing-Along Program at Bailey House Museum, Wailuku. April 8. Ukulele Mixed Plate at The Shops at Wailea. April 25. Maui Steel Guitar Festival at Kaanapali Beach Hotel. May 1. Oral History & Sing-Along Program at Kaunoa Senior Center, Spreckelsville. June 11. Oral History & Sing-Along Program at Bailey House Museum, Wailuku. June 13. Upcountry Fair at Oskie Rice Park, Olinda. June 28. Kokua I Ka Hale Pule at Bailey House Museum, Wailuku. July 18-19. Ukulele Festival at Waikiki, Oahu. September 5. Oral History & Sing-Along Program at Bailey House Museum, Wailuku. September 7. Ukulele Class Party at our home, Kula. September 18-19. Maui Marathon at Ka'anapali. September 24. Hong Kong visitors program at condo, Lahaina. October 2. Kokua I Ka Hale Pule at Velma McWayne Santos Community Center, Wailuku. October 11. Maui Ukulele Festival at Maui Arts & Cultural Center, Kahului. October 17. Ukulele Strumming Workshop at Bailey House Museum, Wailuku. November 14. Maui Ukulele Guild Exhibition at Queen Ka'ahumanu Center, Kahului. November 21. Ukulele Strumming Workshop at Bailey House Museum, Wailuku. December 16. Annual Christmas Party at Kaunoa Senior Center, Spreckelsville. December 19. Ukulele Strumming Workshop at Bailey House Museum, Wailuku. 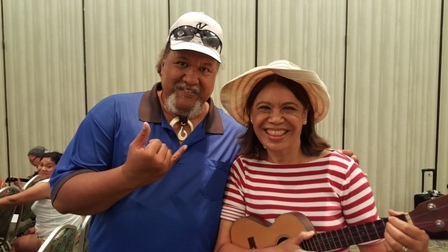 Ukulele Mele got one-on-one help from Willie K at the Workshop prior to the 45th Annual Ukulele Festival.